I purchased my first Raspberry Pi in the fall of 2014. I had no prior linux experience, but I am generally knowledgable with computers. If you are new to Linux / Debian, such as I was, these project files may help you learn the very basics. - In order to prevent errors in cut-and-pasting to and from websites, I have posted all my notes as .txt files. - The text files are best viewed with Notepad in full screen and Word Wrap OFF. - I will post updates periodically. 1. (RPi) Install - New RPi Setup.txt : How to prepare a new Raspberry Pi installation. If you're new to RPi, start here! 2. (RPi) Install - OpenVPN.txt : Installing the free OpenVPN Server with a special client created specifically for Yaesu's WiRES-X servers. Can also be used to run multiple instances of IRLP nodes, D-Star, etc. It can also be used to run a remote Wires-X node from a cell phone, mobile hotspot, or public WiFi, such as while you're on vacation at a hotel! 3. (RPi) Install - EchoLink Proxy Server.txt : Create your own free proxy server so that you don't have to tie up someone else's server... great for mobile use. Last update: 02/25/2015 Added explanation of #!/bin/bash, also added a script for easily viewing the log file. 4. (RPi) Install - Tight VNC Server.txt : A free program used to remote desktop to your RPi (or any computer). Last update: 03/14/2015 Added sudo before the tightvnc command line . . was needed in latest raspbian version. Also added commands to change port number and view log files. 5. 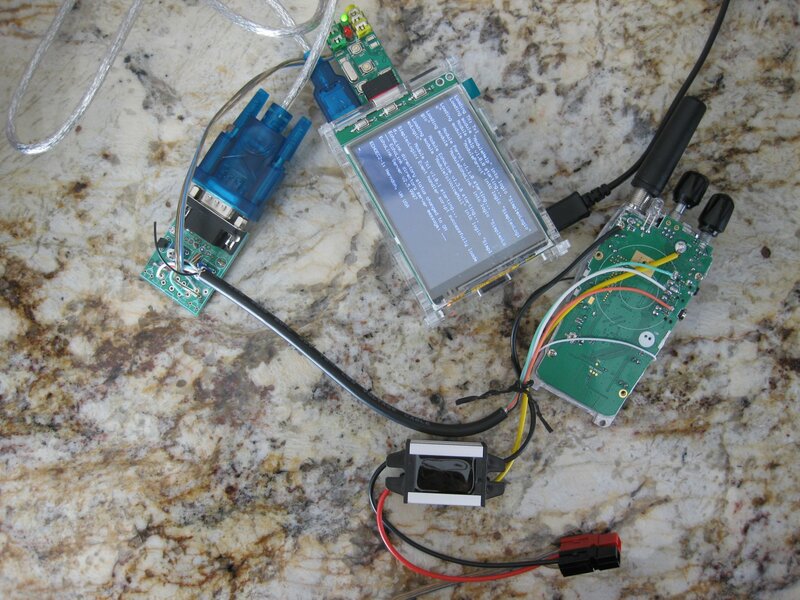 (RPi) Install - SVXLink.txt : Run an Echolink server on your RPi. This document helps you install and config the software. 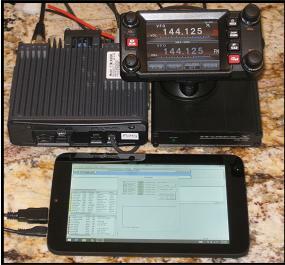 For hardware setup, see "My SVXLink Portable Setup" article below. 7. (RPi) Install - GNU Screen.txt: A free program that allows multiple command line desktops. When installed properly, this allows you to view the activity of your background programs via SSH. 8. (RPi) MOTD - How To Change.txt: Personalize your RPi by changing the Message Of The Day (MOTD), which is diplayed when the RPi is booted and at each login. 10. 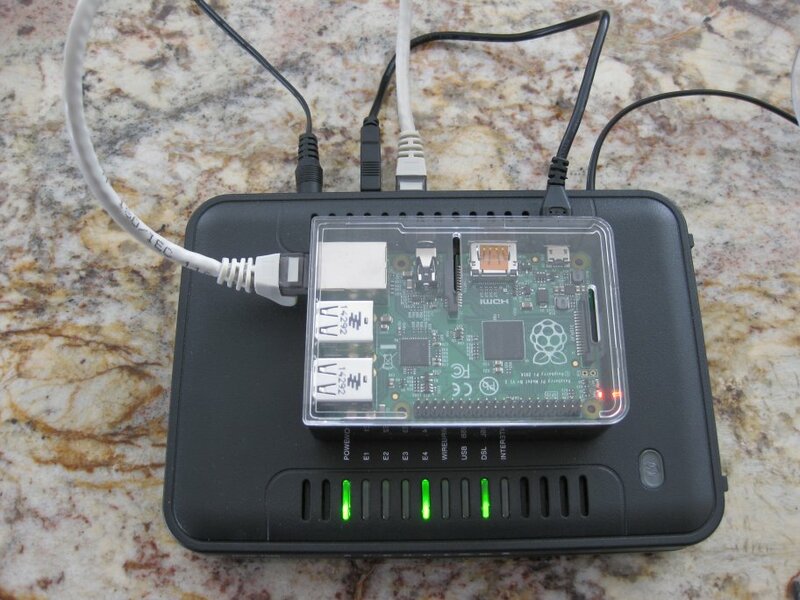 (RPi) Upload IP Addresses To Website.txt: Finding the IP address on a headless RPi with dynamic IP can be tricky. This will create a text file containing all your IP info (LAN, Wifi, Public) and upload it to an FTP server (or website). This is useful, for instance, for mobile use of your SVXLink. Simply view your website on your laptop/PC to find your RPi's address and login. 11. (RPi) Install - Kodi (Fromerly RaspBMC).txt: Install a Raspberry Pi version of XBMC: a media player, comparable to Roku. 12. (RPi) Install - Links.txt: A free text-based web browser. Browse the web FAST while SSHing into your RPi. Links is a great, fast way to "Accept the Agreement Terms" on public wifi connections without having to load the GUI environment. 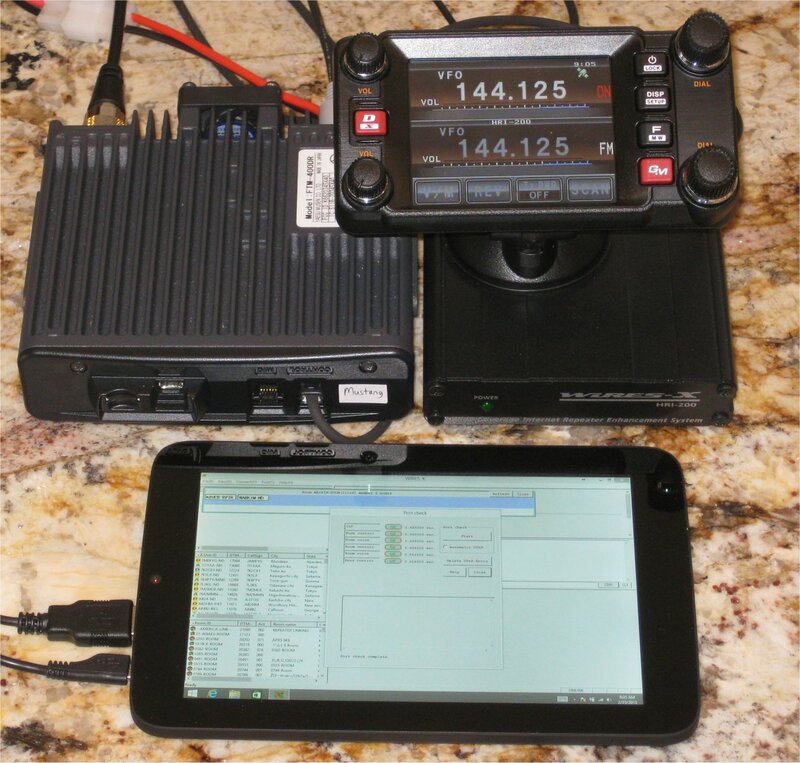 Yaesu's WiRES-X is similar to an IRLP or Echolink node but with more features. Just like IRLP, it requires exclusive port forwarding, meaning each node requires its own external IP address. a. I wanted to be able to run a WiRES-X setup while on vacation, but the hotel does not allow port forwarding. b. 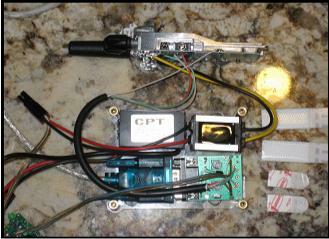 My father wanted to be able to run a dedicated WiRES-X node on his Yaesu DR-1X repeater. He also wanted to run a second WiRES-X node for personal use. Both are located at his home and he only has one internet connection. His repeater's WiRES-X node is connected to a LIVA microcomputer. 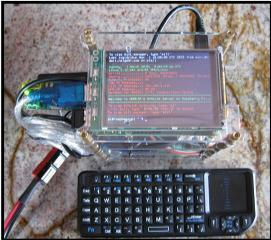 His private WiRES-X node is connected to a WinBook TW700 or an older laptop. We needed to create a Virtual Private Network (VPN). In simplist terms, a VPN is a virtual LAN connection carried over the internet. By putting a VPN server at 'House A' and a VPN client at 'House B', the two houses become connected as one. 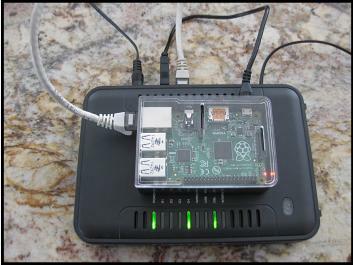 In our case, we placed a Raspberry Pi VPN Server at my in-laws' house. It is connected directly to their router, such as is pictured above. It draws about 3 watts and sits out of the way. We installed OpenVPN Client on my father's WinBook and his older laptop at his house. Now, he can connect both WiRES-X nodes because his older laptop/WinBook is using my inlaws' internet connection through the VPN. Now that we have WiRES-X and OpenVPN Client installed on our 7" WinBook TW700 tablets (thanks to Jerome WD4CWG for suggesting the TW700), we can run Wires-X from any internet connection... hotel, coffee shop, mobile hot spot, etc. 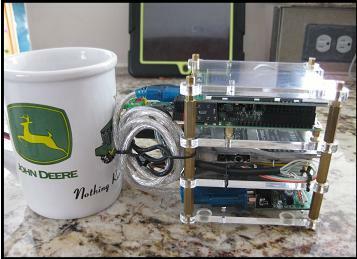 This RPi is running OpenVPN, EchoLink Proxy Server, Tight VNC Server, And GUI Screen. It is now installed at my in-laws' house! My mobile WiRES-X node. A WinBook TW700 running Win8.1, OpenVPN, & WiRES-X.
. 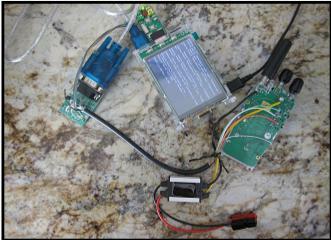 There are newer methods that do not require a serial port adapter, but I have not found one detailed enough. I will attempt to design my own setup in the near future. - I created a text file containing all the steps needed to install SVXLink onto a Raspberry Pi using the same hardware I used. See the (RPi) Install - SVXLink.txt link above. You should be able to modify the config files to match your hardware setup. The hardware before mounting in a case. The power supplies and serial port echolink adapter on the bottom row.